The room is quiet. A student and their instrument stand alone in front of a judge. The musician’s heart is racing as they look down at the notes in front of them, take a deep breath, and begin to play. Band director Aaron Wojcik says that 11 students from South were accepted into the Illinois Music Education Association (ILMEA) this year, competing against students from other top schools in the northwest suburbs of Chicago. Wojcik says that acceptance into the program is an honor across disciplines for high school students. Senior Matthew Baumstark was accepted into ILMEA for the first time this year. According to Baumstark, the pressure of performing in front of strangers was a challenge for him in the past and something he worked to improve upon for this year. Similarly, sophomore Stephen Jang says his heart was racing by the end of his audition. One part that Jang says he struggled with in particular was the sight-reading portion of the audition. While senior Jack Sundstrom also found the sight-reading portion of the audition challenging, he says he believes the audition experience to be beneficial. 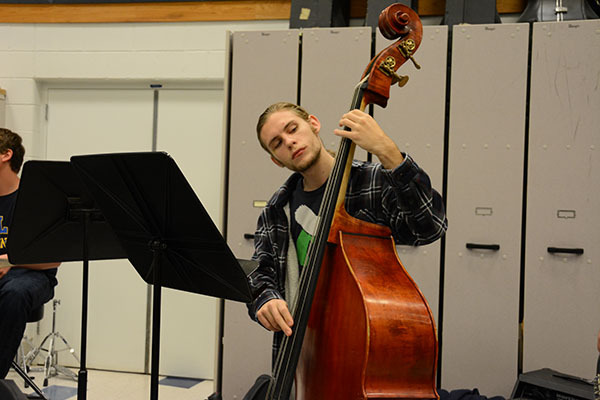 Sundstrom was accepted into the most prestigious jazz ensemble this year, the jazz combo. Baumstark says that, once one is accepted into ILMEA, they then rehearse and perform in a concert alongside other accepted students. The concert is an opportunity for students to perform with new musicians, under the instruction of a new director. For athletes, making it to regionals or state is an accomplishment. Sundstrom says that being accepted into ILMEA is an equivalent measure of success for students in band. Sundstrom says he would encourage his fellow musicians to try out because one can learn a lot from the experience.